Interests: firefighting, NASCAR, model railroading, tropical fish, weather watching/forecasting, christmas decorating - computer controlled synchronized to music. Hello All, I believe my Windows Dell Inspiron 7010 laptop is infected. Over the last day and a half the left side of it on the bottom between the keyboard and the fan gets so hot to the touch it almost burns my hand. It is not all the time, just sometimes and it will shut down and restart and be back to a normal warmth. I used CCleaner and cleaned everything, ran ATF Cleaner and TFC thinking that would fix it. I also cleared my Chrome history. I did a Disk Cleanup at 4 but have not been on here much to find out if that fixed it (it removed 14.5 mb). I also did a threat scan today and it found nothing wrong. one of your disks needs to be checked for consistency. You may cancel the disk check but it is strongly recommended that you continue. Windows will now check the disk. couldnt read before it went off the screen but no other errors were found i know that. I am going to run Super AntiSpyware again, it ran earlier but before it could finish it shut down again and had 635 files it was going to get rid of. I have Microsoft security essentials that i did not run yet or the tweaking registry cleaner yet without advice from on this board. Thank-you for any help on this matter. Have you considered running an offline scanner? By doing that, the virus won't be able to interfere with the scan. Just be sure to create the bootable USB/DVD on a clean computer (not your infected computer). I am unsure on how to even do that. I am going to run another threat scan tonight and post the logs. When i did come back tonight, my SuperAnti Spyware did find 739 items and i removed that, but my keyboard would not work. I restarted the laptop and it still didn't work. I started pushing a few keys and it started to work in the K J area. Don't know if that could have something to do with this or not. Please read the following and be careful following advice from untrained members. Please run the following steps and post back the logs as an attachment when ready and we'll see what the logs have to say. It should be noted that the first scan it got to 12 minutes and the computer shut down and it was extremely hot. The fan was not going. I waited about 2 minutes, restarted and did a scan and this is the report. The fan started up upon restart. The fan has been loud at times in the past year like it is not balanced correctly. Is this a Desktop computer? It's quite possible that you need to vacuum out or gently blow out some dust and dirt from the inside of the computer. That is a very common reason for overheating. Please try to run the other scans and post back those logs too. It is actually a Dell Inspiron N7010 laptop. I did blow the dust out thinking that was the problem through the vent and the bottom grates. It seems when it runs with multiple applications it gets hot and the fan doesnt automatically kick in and run and it gets hot and shuts down. The fan, like i said in a previous post did seem off balance about 2 years now and sometimes vibrates and makes a loud noise. I ran a complete Microsoft Security Essentials scan with no threats found before I came here, also ran TFC, ATF and CCleaner as well and cleared browsing history. Do you think I need to do a system restore or use the Tweaking Registry cleaner I downloaded from this forum on my previous computer issue? Where else should I use the air duster at besides the fan area and where it gets hot? windows failed to start, a recent hardware or software change might be the cause. 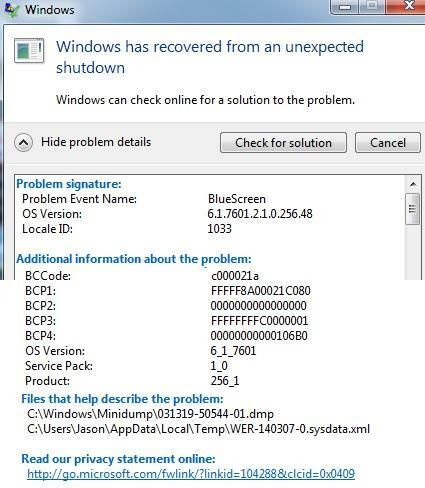 I have screenshot the blue screen report and attached it to this post. It did install windows updates though. Sorry to hear. Though often one can remove the bottom cover of a laptop pretty easy, it is also easy to damage the laptop if you're not careful. Then see if you're comfortable opening it and trying to clean the fan area. If not then maybe ask a local shop how much to do general dust/dirt clean up for you. I think I have taken it apart before to clean it. Do you think my neighbor who is good with computers could do it? He works with computers during his normal work but he is out of town for work right now, that is why I came here and also because I trust the services here. D you think it is malware making my hard drive run so hard that it overheats and shuts down? What about a system restore or the tweaking registry cleaner - do you think I need to do this? Not sure yet if you're infected. Would need to get some other logs but since the computer keeps shutting down that makes it difficult. Yes, I'd wait for your neighbor and when he gets back to see if he can take a look for you to see what might be causing it to overheat. If it's more than a few days we may close this topic, but just send me a private message and I can reopen it. Hello Ron, I talked to my neighbor because he came home yesterday. He is going to take it apart with me but is pretty sure it is the fan that is going bad and not cooling the unit since it only shuts down when the fan does not run. If the fan runs it doesn't shut down. For a few months the fan has made noise like it was unbalanced. He told me to look for a fan because without looking at it, he was not sure if it was a universal fan or a special DELL only fan. I looked up a fan and found a few and I think they are universal but unsure. We are going to look tonight, if its a special order then we will order one and try that. He said his sons laptop had the same issue and that fixed it. Sounds good. Keep me posted. I'll keep your topic open a few more days and wait for your reply. When you replied, I was at my neighbors, took the computer apart, he took the fan out, the other one he had isn't the same so he ordered one off amazon prime and it will be here Sunday. He is pretty sure it is the fan because when you turn the fan it doesn't spin freely. It only spins as far as you can move it with your finger. I will advise you when we get it back up and running. Great, hopefully, that corrected the issue and you won't see that again. Let's go ahead and get all new scans and logs to see what we can find. Updated malwarebytes scan. Also did the adw cleaner. I will do the Farbar later this evening. HKU\S-1-5-18\...\RunOnce: [SpUninstallDeleteDir] => rmdir /s /q "\SearchProtect"
Thank you for the logs. Going forward please try to attach the logs if possible instead of copy/paste. Let me have you go run the following clean up for Chrome. Once that's done then let's try running another antivirus scanner from Kaspersky and see what if anything it finds as a secondary confirmation. Hello, sorry for the delay, I have been sick, I will try running these today. Plweq, we did clean out dust when we took it apart to replace the fan, it has not gotten hot since then. No problem @fireman5214 hope you're feeling better soon. When ready, clean Google Chrome from the provided link. Then scan with Kaspersky and let me know the status.